"Is anybody sitting here?" He pointed to the empty chair across for me. "Coffee shop is a little crowded today." He gave a small shrug as he carefully set down his mug of coffee (I could smell that it was a white chocolate mocha - same as mine) and a book on the table. "Oh," I said absent-mindedly. I hadn't really noticed. Peeta and Katniss had kept me distracted. "I've been reading." I motioned to my book. He gave a small grin. "Ah, that's a good one." "I hated the third one, though." "Well," he said abruptly. "Don't let me keep you from your reading. Really, there just wasn't any other seat and you seemed like the least likely person I could bother." I cocked my head a little. "Why's that?" "Well," he began again. 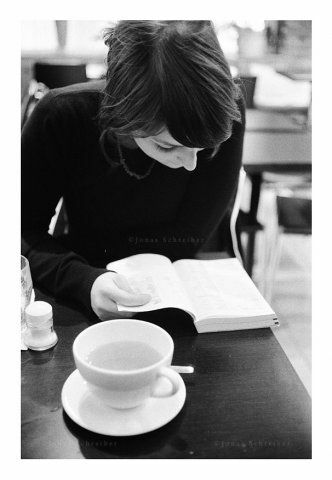 "Because you're sitting by yourself in this way back corner of the cafe with a book and coffee and no one else around. I just thought that if I took this other seat - which isn't too close to be in your personal space, yet near enough to share your table - I just thought I could drink my coffee and read my book and you wouldn't even have to notice I'm here." I was slightly amused by his logic. I gave a shrug. "Sure." I looked back down at my book, but only a few seconds later, his voice broke into my thoughts. "Sorry to interrupt again, but I just realized how rude I must sound." I gave a slightly puzzled looked. He reached across the table and offered his hand, to introduce himself. I told him my name, and asked, "Do you live far from here?" "No. I come here quite often actually." "Oh really?" I said. "I've never seen you here before." "Are you in the habit of noticing young men?" I felt insulted for only a moment before I realized he was being sarcastic. Two can always play at this game. "Of course!" I answered quickly. He laughed. A nice, musical, manly laugh. "Well then apparently I'm not much to notice." I didn't answer. Rather, I held my book up closer to my face and continued reading. I got lost in my own little world again until I felt something vibrate in my pocket. I reached for my cell phone, saw it was my mother calling and quickly answered. "Honey, where are you? You've been gone for almost four hours." "Oh sorry, Mama. I'll leave right away. See you in a bit!...Uh-huh...okay, bye." I stood from my seat and gathered my book and mug. It wasn't until I was outside, almost to my car, when I remembered the young man who had sat across from me. And again, I thought how strange it was that I had never seen him there before. He had followed me outside. He walked across the small lot until he stood just a couple of feet away from me; hands shoved in his pockets, the slight breeze gently ruffling his hair. "Actually, I need to ask you something." I raised my eyebrows, still waiting. "If you knew that you would probably never get the chance to do something, would you take a shot at doing it at least once to see what would happen?" My brow furrowed slightly as I pondered his question. First of all, what a strange thing to ask after having only met a few hours ago. And secondly, in a cafe parking lot? This seemed like more of a question for a college classroom. But I knew what my answer was. "I would take a shot at it. It's called faith to hope that something good will come of it. And anyway, I hate living with regrets." He grinned at me. "Me too. Which leads me to my next question..."
I stood waiting. He seemed flustered. He shoved something into my hands. A piece of folded paper. "Just...read it when you can. I'll see you around." He nodded, with a smile, strode to a nearby car and drove away. I was shocked, to say the least. Exactly what had just happened? You may not recognize me because I never made myself known. I never purposely came on the days you were here. I felt like I should take a chance. Do you know what a princess is? ...so call me maybe. Okay, I'm kidding! And yes, I am smiling, widely! This is...really, really cream-and-sugar. Fiction or non-fiction, that's what I'd like to know. But this made my day! Very lovely, Raquel. That's was so sweet of him ! Pray about it and maybe you should call him back. :D Have a great day Miss Raquel. Aahhh!!!! I felt like saying "I knew it!!" When he showed up at the parking lot. PLEASE tell me this is non-fiction, as in it really happened and to YOU!! It would make my day. I love hearing about real-life stories like this. If it did happen, PRAY about it and let God guide you. If he leads you to call him, then trust me, He's got something amazing in store. And if he leads you not to, He still has something amazing in store! What a romantic story!!! Is it true? If it is, did it happen to you?? True or not, it's really good! Girl, you are SUCH a tease! If this was fiction, it was absolutely so incredibly sweet. If this was true, I'm swooning like the girl above for you :) In short, I adore it. OH this is like my absolute favourite thing ever to read. everyone else has asked and i need to, too: REAL OR FICTION?!?!?! Oh, Raquel. ;) What a good story! WRITE A SEQUAL!! That was one of the most romantic stories I have ever heard! Sending this to my friend who is a lover of romance. The last part of the note was the sweetest thing! WRITE A SEQUAL!!! I am all for cutesy things and this was definitely swoon-worthy. If this was real, you need to call him. :D If not, do you mind if I now add this guy to my list of fictional crushes?